Jetty East beachfront condominium home for sale in Destin . 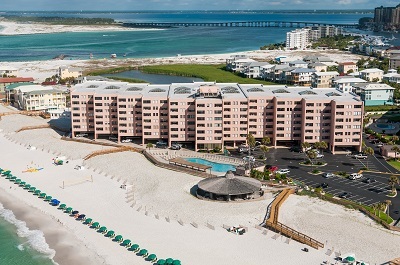 Resort property with views of the East Pass and Gulf of Mexico. The owners have shown love and care with their upgrades. The kitchen features Granite counters and Kenmore Appliances. The Master Bedroom and bath has a vanity which is unique to this unit. The guest bath also features a granite counter and a seamless shower door and fully tiled walk in shower. A unique feature to this condominium was renovating the wall at the entrance of the master bedroom, which really opens up the hallway entering the living/dining room area. Large tile runs from the foyer through to the living/dining room. The ceilings are ”Popcorn” free. Ceiling Fans in the Master and Guest bedrooms. New A/C 2013. New Hot Water Heater 2015. Stack clothes washer & dryer, home is convenient to the elevator & stairs, ideal real estate investment and/or private residence.